We all have a sweet tooth. Sweet treats after all can add zest to lunch or dinner. One of the most popular desserts is the cupcake. This classic favorite treat comes in a variety of flavours – the good old corn, delightful blueberry, tasty cheese, and even chocolate chip muffins. But the sweetness of cupcakes also has a downside. Too much sweets and calories can be bad for the health. Well, there’s no reason to avoid cupcakes despite that because there are healthy ingredients you can use for this treat. Reduce the sugar in your cupcake. The first thing that you have to do to make healthier cupcakes is to reduce the amount of sugar. You can actually lose as much as fifty percent of calories by shaving off one tablespoon of sugar in your recipe. If you really can’t afford to lessen the sugar, you also have the option to add artificial sweeteners as a replacement in order to get rid of those extra calories in your cupcake. Substitute high calorie ingredients. Aside from reducing sugar, you also have to substitute high calorie ingredients for your cupcake. For instance, when you bake, use fat-free ingredients such as fat-free sour cream, light cream cheese, low-sugar syrup, etc. The fat-free and low-sugar versions will help you reduce those extra servings of calories. Not only that, you will also reduce saturated fat on your recipe. Use whole wheat flour. Instead of using white flour for your cupcake, replace half of it with whole wheat flour. Did you know that one fourth cup of whole wheat flour contains more fiber and phytochemicals? This is good for the body because whole wheat flour helps slow down digestion. Add some citrus. If you want to boost the flavour of your cupcakes, you can opt to add some citrus on your batter. The citrus’s outermost layer contains a zesty flavour which is a convenient way to improve the flavour of your batter and dough minus the extra calories. Use non-stick pans. Finally, by using non-stick pans you can help reduce the use of high calorie ingredients. All you have to do is spray some canola oil on your non-stick pan or bake ware so that you will no longer have to use a lot of fat. Your cupcake will turn into golden brown and the best part is they won’t stick. Turning high calorie cupcakes into a healthy dessert is possible. Just follow these simple tips and enjoy your sweet treat without worrying about your health. If you love baked goods, be sure to check out www.yeolesweets.com! There are all sorts of tasty treats to try. I like to reduce the sugar, and add fruit. I have really limited sweets.. I should try to make them healthier yogurt is great for baking. i make cupcakes all the time, would love to try a couple of these ideas in mine next time. good ideas! I’m currently doing a program so no sweets for me but those are beautiful cupcakes. Gorgeous cupcakes! Thanks for the tips! Beautiful cupcakes! Anything that can make them a little healthier for my kids works for me! Thanks for the tips! I like baking healthier foods. Hmm, whole wheat flour, that’s an idea! I sometimes use yogurt or applesauce in place of the fat needed. I think I’d start with just shaving off a teaspoon of sugar at a time to see how it tastes without so much rather than using a fake sugar. I love the idea of adding citrus! I’d never have thought of that. 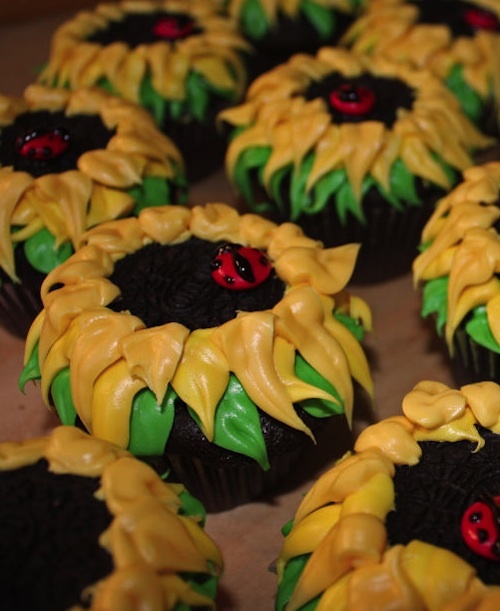 I would love to try and make these Sunflower Cupcakes (emphasis on try)because they are my favorite flowers. I do have an incorrigable sweet tooth so I love hearing the news about the losing 50% off your calories by s having off just one TBLSP. of sugar!!! Sigh … cupcakes. Healthy or not, I want one! My kids love cupcakes! Thank you so very much for the tips! Thanks for the great tips. I love making cupcakes. Those are gorgeous cupcakes, I’ve been looking for a lot of ways to lower calories lately. Those cupcakes are awesome! I’d be interested to know how much of artificial sweetner to use to replace the sugar. I can’t imagine that it would be equal since artificial sweetner is much stronger? I love those cupcakes. I’m not a baker but I love to cook other foods. I experiment with different kinds of sugar substitutes! It can make a big difference in the calorie count! Great tips. I haven’t had a cupcake in months! I recently started making all of our baked goods with a natural sugar substitute as well as lighter calorie ingredients. I am SO happy with the outcome and not one complaint from the family! I need to try these tips, thanks! I love cupcakes but most of them contain so much sugars and fat, this is really something nice to know! I like to use applesauce to cut the fat in the recipe, we have also used yogurt like someone else suggested.